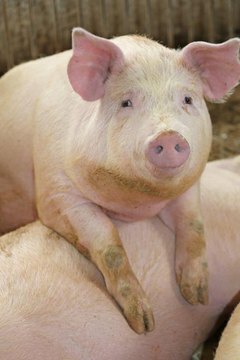 Pigs are intelligent, strong and hygienic farm animals. Raising pigs requires a pen area with adequate space and access to food, water and shelter. Despite their reputation, pigs are clean animals when provided a nice pen. Keeping pigs in a mud puddle is not acceptable and will cause discomfort. The argument between portable and permanent pens is ongoing and the decision is ultimately in the owner's hands. Portable pens provide the advantage of rotating the pigs on fresh ground. This provides natural forage, disperses waste naturally and reduces the need for cleaning. Simply move the pen after the pigs have worn through a patch of ground. Portable pens are only an option for landowners with the space to move their pigs. Permanent pens allow for a permanent shelter and stronger fencing buried in the ground. They require regular cleaning but the pigs have a sound shelter and are less likely to escape. Piglets are small and capable of squeezing through tight gaps. The housing needs for piglets are the same as adult pigs but with less space to escape. Cover your fence with wire panels to cover large gaps in your boards or metal panels. Also provide food and water troughs at a reachable height for piglets. Isolate weaning piglets and their mother for natural feeding in a rearing pen. Keep your pen floor covered with dirt or grass and add soft bedding to the covered section of the pen. Use straw or cedar shavings as bedding material for comfort in the protected area of the pen. Remove and replace the bedding at least once a week to maintain a clean area. The unprotected section of the pen will wear over time as the pigs dig and move dirt around. They will work through grass quickly and mold the area to their liking. Maintain a small ditch or sloped area to encourage drainage and to keep the ground dry. Water and mud will combine with feces to create an unsanitary environment. Build a french drain with gravel before you build the pen. The drain allows for pressure washing and cleaning pigs inside the pen. The easy cleanup and drainage makes maintenance easy. Pigs require roughly 50 square feet of space per animal. They are hardy animals and do not require insulated housing but they do need protection from the elements. Build a roof or overhang on the pen where your pigs will escape rain, snow and wind. In most scenarios, you will raise pigs through the spring, summer and fall months and butcher before the winter. Provide a constant supply of water and place your water trough in an isolated area. Pigs urinate close to the water supply and space between food and bedding is ideal. Keep a food trough with a constant supply of mash and grain to grow your pigs before butchering. Sturdy fencing is critical for a pig pen. Use metal livestock fencing or large round fence posts and boards to contain your pigs. Bury a board as your lowest level railing to prevent digging and burrowing. Pigs will burrow and escape when given the opportunity. Also consider electric fencing to prevent burrowing and attempting to escape. Put electricity everywhere except the gate area. Pigs have a sharp memory and will refuse leading outside the pen when the threat of electricity is present.